July personal income figures released today show an increase in spending relative to income. This is not good news because the higher spending means savings rates are down and household de-leveraging and spending adjustments are not proceeding. Furthermore, revisions for the first and second quarter show higher spending than previously reported, implying that adjustment is occurring less fast than previously estimated. In my view a robust recovery will occur when (and if) households have finished adjusting their spending to new, lower, levels of lifetime wealth. The 2008-2009 recession and the current recovery are all about households de-leveraging and adjusting spending levels downwards relative to income. I believe households still have some way to adjust, and perversely government stimulus (implemented to ameliorate the impact of the recession) may have simply delayed the process. Yes, savings rates have recovered dramatically from the lows of 2007. 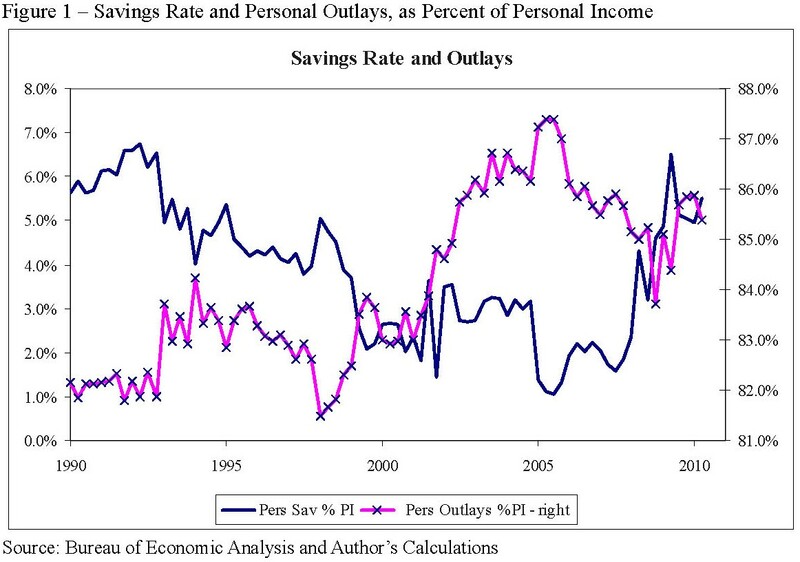 But most of the rise in savings rates has been due to tax cuts rather than lower spending. 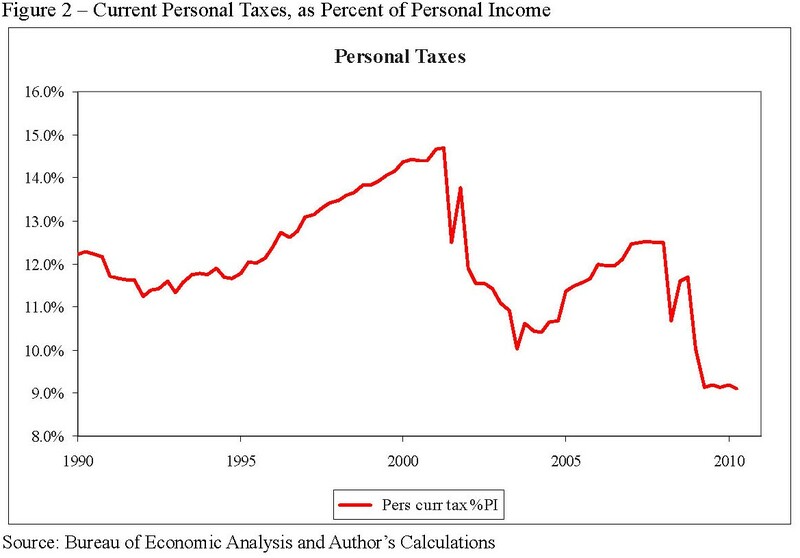 At some point taxes will have to rise to address fiscal imbalances, and households will likely adjust down spending in response. Table 1 shows the current savings rate and spending rates, quarterly. The savings rate for the second quarter of 2010 is dramatically higher than for 2007, but almost all of the change in savings rate has been due to falling taxes rather than lower spending. Table 2 shows monthly figures, with July personal outlays as a percent of income rising slightly and savings rates falling. There is no doubt trouble stored up for the future. Since the bubble burst in 2007-2008 all forms of wealth have fallen – falling housing prices have reduced real estate holdings; stock markets have fallen or stagnated; and, probably most importantly, employment and prospects for future earnings have fallen. The fall in lifetime wealth should naturally induce some adjustment in household spending. The recession was simply that adjustment of spending to new levels of perceived wealth. •	Spending has risen from about 83% of income (1990s) to over 87% in 2005 and is now roughly 85%. It is still high by historical standards and supported by low taxes, although not as high as during the bubble.